Nowhere in Germany is the concentration of German flags stronger than on Berlin's Fanmeile (Fan Mile). Only open for special occasions (like World Cup and the UEFA Europameister), national pride makes a rare appearance in the largest fan zone in Germany. Hundreds of thousands of fans (an estimated 500,000) regularly turn up for major games. It is a jubilant, crowded, chaotic, delirious good time. But there are some things you should understand before showing up with your noisemakers, face paint, and flags. Here is everything you need to know about Berlin's Fan Mile for the 2016 European Championship. Where Is the Fan Mile? Red, black and gold stretch as far as the eye can see - further than a mile - in Berlin's Tiergarten on historic Straße des 17. Juni. 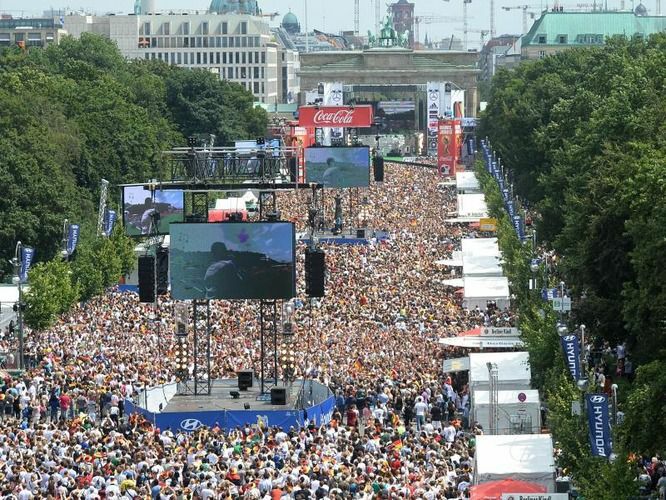 With a giant 80-square-meter screen in front of Brandenburger Tor (Brandenburg Gate), six more XXL screens dot the nearly two kilometers towards the Siegessäule (Victory Tower) and live stream the games being held in France. There is also a main stage at the Tor where performances are given before and after the games. Note that the street will understandably be closed to traffic as people crowd the roadways. This includes adjacent streets and may close down nearby transport stops like S-Bahn Brandenburger Tor and the U- and S-Bahn Potsdamer Platz due to overcrowding. If arriving within an hour of the game (many people show up frightfully early to secure the best position) consider walking in from Hauptbahnhof (main train station) or stations Friedrichstrasse, Bellevue, Bundestag, and Tiergarten. You could also approach from the back by getting off the many buses that stop at the Siegessäule. What games are shown on the Fan Mile? Thumbs pressed that they make it at least to the second round and all the way on to the quarterfinals, semifinals, and finale on July 10th. They've done it before (winning in 1972, 1980, 1996). From the round of 16, all matches will be shown on the fan Mile. This public viewing site is so popular, it often maxes out on capacity and may be closed hours before the game (as it was for the 2014 World Cup Finals between Germany and Argentina). There is no seating, so people stand for hours before (in anxious anticipation), during (carried by the crowd's cheers) and after (hopefully in wild celebration). Make sure you are up for the challenge. And the area is not just closed to road traffic, fences are set-up throughout the Tiergarten to block unauthorized entry. Thorough security checks slow down entry and restrict prohibited items. So, what isn't allowed? Bulky items such as ladders, stools, folding chairs, large bags, etc. Most of these are completely understandable. Nothing needs to add to the chaos already present within the Fan Mile. Another thing to note is that while there is no rule regarding age limit, this is not the best environment for babies and toddlers. The crowds are intense, the noise level is very high and little bodies and ears might not be up to the challenge. There are plenty of other venues within the city that are better suited to families. If you feel "What is soccer without beer?! ', don't worry about the restriction against bringing booze. There are plenty of places to buy food and drink (as well as non-alcoholic options) within the venue. An estimated 400,000 liters of beer only are consumed on the Fan Mile. People also sell beers all the way from the stations to the entry points. Note the giant piles of bottles left outside the gates. There are hundreds of portable toilets available for use, but some people prefer to use the many trees accessible in the Tiergarten. Please don't do that. There have been problems in previous years with not enough toilets (referred to by the administration as the Pinkelproblem or 'pee problem'), but wanting to avoid that mistake they have promised to provide more toilets than ever this year. If it rains? It rains. And the party rages on. A break may be called in a heavy storm or in case of lightning, but the show will go on. Doge the raindrops beneath the trees and then get back in front of the screen for the action. Though violent crime is rare in Germany (even with the drunken energy that goes with these events), Berlin's Fan Mile is a pickpockets paradise. Protect your valuables by leaving anything irreplaceable at home or back at your hotel. Valuables should be carried in a bag or backpack carried in the front of the body or tucked under the arm. Bauchtasche (Fanny packs or bum bags if you're British) never lost their place in Berlin fashion and can be worn proudly.